Nail accidents can happen at any time. We consider ourselves careful when it comes to our nails but sometimes, mishaps really do happen. Whether doing everyday chores or moving furniture, we break or chip our nails. And we know how frustrating that is. How can you feel good about yourself when something doesn’t feel right? Luckily, we’ve done all the research for you and present the best nail kits. Read the list below and hopefully, you’ll find one that meets your need. It is the best nail repair kit for us because it’s the best one we’ve tried so far. 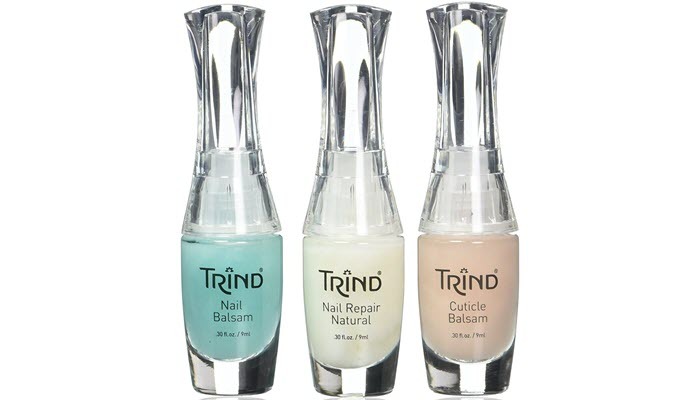 The Trind Perfect Cuticle and Nail Kit is a must for maintaining a good pedicure or manicure. It helps in preventing hangnails and removing overgrown cuticles. It also helps in rehydrating your dry toenails and fingernails. This kit comes with three bottles: the Trind Cuticle Balsam, the Trind Nail Balsam, and the Trind Nail Repair Natural. They all work together to support natural and healthy nail growth. The Trind Cuticle Balsam is the first product in this kit to be applied. It will go down the root of your nails to give it the moisture it needs and keep it there. You may apply nail polish immediately once the product dries. Secondly, the Trind Nail Balsam has moisturizing factors to keep your nails from getting brittle. Both balsams are easily absorbed by the skin so all you have to do is wipe off any excess after a few minutes. Lastly, the Trind Nail Repair Natural helps strengthen your nails to avoid breakage. Consider it as a top coat—you must let it dry completely for better results. Remove these layers with an acetone-free nail polish remover the next day. Repeat the same process and do it every day for two weeks to see progress. 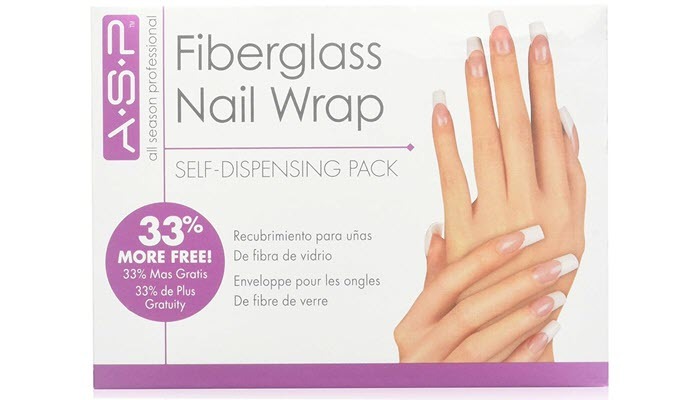 If you want to repair broken nails in an instant, the ASP Fiberglass Nail Wrap is what you’re looking for. You can cut it in any way you want and is self-adhesive for that quick fix. What we want most in this product is it comes in a self-dispensing pack. This means it comes with an opening on top of the box where the sheet comes out so the roll won’t go anywhere. You won’t end up making a mess so it’s perfect for people on the go. Use it with daylight gel, resin, or UV gel to finish it off. Each roll lasts a long time so you save a lot. However, it is quite tricky to use so it may take a few tries before perfecting applications. One thing to keep in mind, though. It’ll look like fabric once applied. But don’t worry—it will turn clear once layered with clear nail polish, so you’re good to go! Gone are the days when you have to file down your nails when they break. 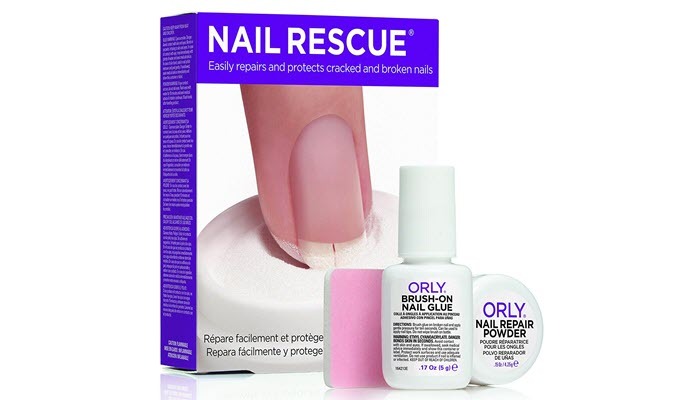 With the Orly Nail Rescue Kit, you can easily repair your nails and let them grow as long as you want. Broken or cracked nails can now be fixed in just three easy steps. This kit comes with brush-on nail glue, a nail repair powder, and a nail buffer to give nails long-lasting and flawless repair. You first use the glue to bond your broken nails together. Make sure it gets all over the area to be repaired and be careful not to get it in your cuticles. Dip your nail immediately into the powder and make sure your nail is evenly coated. Smooth out rough edges by lightly buffing your nail. Repeat the three steps for extra strength. However, the nail glue smells a lot like super glue so skip on this product if you are sensitive to harsh smells. But if it doesn’t bother you, make sure to fix your nails in a well-ventilated place. We also didn’t like the buffer that much. It leaves the nails with an uneven texture so if you’re into matte polishes, we suggest upgrading or using your own buffer. 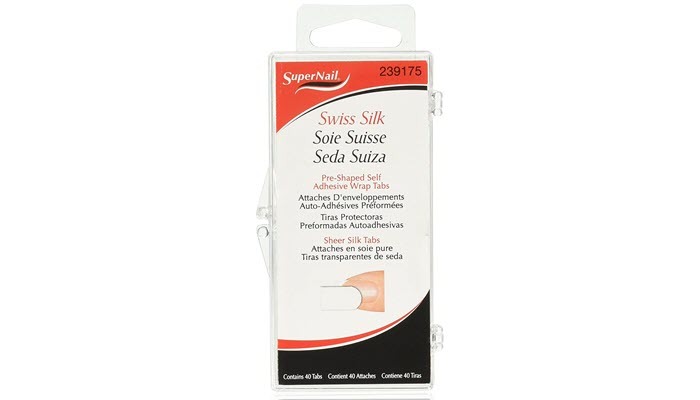 You will surely love the Supernail Swiss Silk Self-Adhesive Wrap Tabs because they’re already pre-cut. The tabs are curved on one side to mimic the natural growth of nails. These stickers are very thin so they look very natural on your nails. They’re very soft and fragile once out of the box but can last for weeks once you put nail resin or polish on. But with all the cutting and peeling-off, this product also needs a lot of getting used to. Just have more patience and practice more and we assure that it will go smoother and easier. We like to layer them to give our nails more strength. Then, we put nail glue behind our nails to make it more durable and to make them last longer. If you consider yourself careful with your nails, we recommend products that need to be applied regularly to take care of your nails. But if you’re the opposite, we suggest buying kits that let you repair your nails in an instant. Nail repair products often come with a brush-on applicator; but if you want the quick fix, those that are self-adhesives are recommended. The cost of nail repair kits vary from brand to brand, so we suggest doing some research first on which products have worked for others and which ones have not. The Trind Perfect Cuticle and Nail Kit is our pick as the best nail repair kit because it’s the only one that worked for us. It may be quite pricey but we assure you this kit is worth the investment.